When I first bought this washer, I thought it was great. But, my clothes were pretty clean to begin with. Within a couple of months I began to notice that my laundry just wasn't clean like it used to be and began 'watching' the washer. It wet the items, but only truly washed what was loaded first, or those clothes at the bottom of the washer. The rest never got clean because soap and water did not go through the fabric. I bought the unit because it was to sense the load size. After having 2 technicians here, I've found that the washer always fills to the same level, regardless of the load size. In order to get my clothes clean (4 people household, 3 little boys) I have to 'babysit' the washer, add water with a hose and be sure that I pretreat absolutely everything before it goes in. Find another washer, you'll regret buying this -- I sure do! Mine has broke down twice. I bought my GE washer and it has not been as good as it was sold to me to be, and I am very sorry I spent the money for it. I hve to try to fix it this time my self or junk it. GE you should be ashamed to sell such a piece of junk for that price. You should fix or replace it. i hate this washer. you can only fill clothes loosely to halfway up from the bottom. the top clothes stay dirty. i must manually fill for every load since the washer cant sense where the clothes are. lame. DO NOT BUY THIS MACHINE , YOU WILL WASTE MONEY AND TIME TRYING TO REPAIR IT. Very unhappy with this product. After 4 years, we finally abandoned this p-o-s. We decided to buy a REAL washer, you know, the old school kind that actually uses WATER to wash clothes. Went with a conventional Whirlpool on sale at Lowes, and so far so good. It's nice to have clean, fresh smelling laundry again. So goodbye HE and we will certainly never buy another GE appliance. HE is a great idea but is not truly market-ready. Hopefully it will be by the time this new washer needs replacement. I suggest you all go out and buy a real machine, before HE is all that is available. Sad but true. Nice ideas in theory, but washing machines are bought by people wanting to WASH their clothes. My clothes come out wrinkled and dirty. Visited my daughter recently and after using her washer I realized just how crummy this machine is. IT NEEDS WATER!!!!! I am taking a loss and going to buy a new one. This is my last GE appliance. I hope this company reads these comments. I bought my GE washer 3 years ago and have had nothing but problems with it. Water leaked (poured) from the bottome of it and now (only 3 years later) the motor has completely gone out on it (from all the water that got into it while leaking). DO NOT waste your money on this product!!!! This was the worst purchase I ever made and will never buy a GE appliance again because of it. I was amazed by the lack of machine machine noise when I first purchased it. Purchased in 2010. Anytime I have a problem with the quality of the wash I troubleshoot and it has always been improper use on my part. Overfill of clothing, off balance, etc. I have a Marine and two children. We used to wash his uniforms separate from our clothing due to odor transfer. This happened with multiple types of detergent, borax additive, booster additives, etc. However, we do not have this problem with this machine. This has cut down on the waste from washing partial loads and I have had to break my husband of the habit! I've had this machine for a few years and have posted before about the moldy smell (which still happens). But besides that, it really is just a bad machine. Now many of the controls don't work, forcing us to use the 'extra heavy' setting for all. Clearly GE should be recalling this piece of junk. A class action suit is tempting but it's probably just easier to go buy a REAL washing machine. GE you are dead to me. My clothes do not get clean. After a full wash cycle my towels and sheets (when my son wet the bed) still smell. I miss my old washer. These new ones just don't cut it. I hate this machine!!!!!!!!!!!!!! !Buyer beware!!! I have had nothing but trouble with this machine. If I do not leave the lid open(while not using) its stinks to high heaven. Which is by the way very dangerous for small children. Wonder what GE would do if one of my kids falls into it?It does not rinse at all. I have to take my dishcloths and wash rags and ring out the soap before we can use them. It makes a horrible sound when washing on the heavy and extra heavy cycle. The bad part is I cant afford to replace it. Will never buy another GE. Should have known to go with Whirlpool or Maytag. The water did not stop and over filled the GE washer tub. As a result, my laundry room and basement below got flooded. Thank God, I was home to stop this. This GE "Hydrowave" washer is less than 5 years old. My first washer, a Sears Kenmore, lasted 17 years. We are only able to fill the washer about 1/4 full of loos laundry. Many times I have used a bucket to raise the water level. If the load is half full or more the detergent is still on top at the end of the cycle. I am shopping for a new washer to replace my new washer! We have had if for less than one year. This GE washer has never cleaned my clothes properly in the two years I have owned it. After two visits by technicians I gave up - the last technician admitted that he had had numerous complaints about this model washer and had never satisfied anyone i.e. the problem is unfixable. Like others I will never trust GE appliances again and will buy other makes. Why go through this nonsense again? I will never buy another GE washer. Mine is only 2 years old and I hate it. It doesn't fill up with water no matter what level I set it at. Why have any selections listed at ALL???? It is a Joke.I don't know what can be done about the new washers. I was told by 2 GE customer associates that this washer isn't suppose to wash LARGE LOADS... WHY?? WHAT are to do to get our clothes clean??? I was also told that they are being made by the Government regulations and there isn't anything that can be done to Change it... NOTHING to change it. I sure hope us customers will complain enough so they can't do this to us. We have to spend the money and get a crappy machine. My clothes doesn't even get wet and this week my washer stopped spinning. Well today I bought a whirlpool Washer from Lowes and it was the only washer that doesn't have a Sensor on it and was told this is the last model. Again I was told there is NOTHING I can do about it. They are making all the the machines the same way to save water. It isn't saving water when I manually have to keep putting water in the GE washer to get enough water to cover my clothes. I can only hope someone will make them change their minds about changing to the water sensors. The last 2 years have been the worst I have ever had with an appliance. But finally today after many service calls and complaints I can happily say my stupid GE Washer is dead! I will never buy another GE appliance again. The customer support and technical help was worthless. Maybe GE should spend more money on actually helping their customers instead of commercials saying how great they are. I purchased my washer a little over 2 years ago. From the first week it would have trouble filling up with water. It would work intermittently. I have to babysit it. to be sure it fills up. The water could run for hours if I just leave it alone, wasting water, soap and electricity. I had a GE technician to my house twice and each time he does a computer diagonosis and says there is nothing wrong. I have a 3 year in house warntee and it does me no good. I will never purchase another GE product again. GE used to stand for quality and integrity, not it stand for throwing your money down a sinkhole. 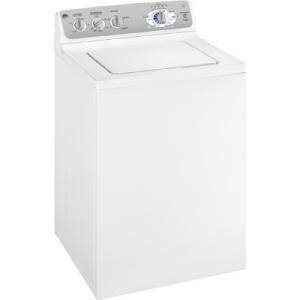 This is an update....GE switched my first washer out for a top loader and after using this thing for months....I am still of the mind that I would not buy another GE if my life depended on it. Every load of dark clothes is loaded with lint.....I don't think the washer has a lint filter! What a total waster of money! DO NOY BUY A GE WASHER! Purchased 17 months ago and this is the worst washer I have ever seen. Now it won't spin and leaks all over from the bottom of the washer. What a waste of money. Worse Washer that I have ever bought! Does not clean clothes! Now it is making a very loud squeaking noise. I had trouble with this piece of S*** since I bought it 2 years ago! I am trying to find out why it is now making this noise. I wish I would of seen this site before. I thought It was just me that it was not cleaning the clothes not I know. When I wash Towels I can only put 7-8 in a load and this is to be a EX large Washer! Should of never listen to my boyfriend. He talks me in to the rip offs! GE WHRE5550K "Save your money"
I purchased this washer in June of 2010, and had to have a technician out to replace the infusor, because it tore a few garments. After a year of lite washer loads, that's the only way my wife noticed they could get somewhat clean, like one of the other comments, I have noticed that my clothes are actually dirtier now. After a year and one month exacty, my wife heard a loud noise from the washer, it stopped working during the start of a spin cycle, and it did not work anymore. Tried resetting the motor, test the magnetic switch, diagnostics led flashes 6 times, which means motor is bad or control board, this might be the reason that GE upgraded the motor, I'm not spending $180 on a new motor, i'm just going to dish out a little more money to buy a real washer, Whirpool, Maytag, LG, going towards LG and Maytag for their 10 year warranty on the motor. Affresh or Smelly Washer Cleaner will definitely help the horrible musty smell. Apparently it is caused by a build up of 'soap scum' that mold will feed on. Follow the directions and use it regularly, then wipe out the drum with paper towels. I have neglected to come back on this site and update everyone. GE replaced that piece of **** washer after I got channel 12 involved. This washer has an agitator and fills to the water line that I request. Does a much better job of cleaning my clothes. GE asked if I wanted to pay another $500 some dollars to upgrade....no way! After several phone calls we were able to agree on the trade. And when this washer quits.....I don't suppose I will be buying another GE. Hopefully this washer will change my mind about GE products! Who knows. It is noisy and it does not spin as fast as the one they replaced so I am doubtful. Purchased this machine at Home Depot Dec. 2010 and regret this purchase immensely. There is no visual doubt that this machine did not clean our clothes. Even worse, it has caused three floods in my mudroom as fill sensor must not be working properly and the water keeps going in until the machine is stopped manually. A nightmare. Went onto GE site for troubleshooting and found this site. Wish I had seen it before I gave them my money. Looking for a new machine and neither GE nor Home Depot, for selling this junk, will get my business. Expensive lesson. Rate it 0 stars. I had purchased and was going to have this GE model washer (WHRE5550kww, 4.1 cu')delivered tomorrow from Best Buy. Thanks to all of your shocking comments-which I read just now- I was able to call off delivery and cancel the order. Thank you for saving me the headache that so many of you are having. I wish all of you experiencing difficuties good luck in resolution from G.E. I always thought so highly of G.E products in the past that using them as a replacement was a no-brainer. Such a huge company Should stand behind it's product and resolve these issues. I will NOT buy a replacement from G.E because of all of these negative remarks. By the way, I'm not usually a suspicious person, but when the complaints are so uniform and overwhelmingly negative,then to read 3 out of 50 reviewers are praising this machine highly, one could conclude that something's fishy, hmm? I have black gunk on my clothes. I have lint on my clothes. The clothes are tangled. The washer is slow. The washer is very loud. I do not enjoy doing laundry anymore with this washer. This washer is a piece of crap. IF THIS SITE IS LEGIT, AND THIS MACHINE IS THIS AWFUL, WHY IS GE STILL ALLOWED TO SELL THIS MACHINE!! I AM SO ANGRY, I JUST BOUGHT THIS MACHINE IN A PANIC AND AM SOOOOOOOOO UPSET AFTER READING ALL THESE REVIEWS, IT IS GOING BACK TOMORROW!!!... BUT GE SHOULD TAKE IT OFF THE MARKET!!!!!!!!!!!!!!!!!!!!!!!! I bought WHRE5550K about 6 months ago from a local appliance chain in Concord. Liked the low water requirement as we have leach field problems. It also spins very dry. Not happy with results, but kept giving it the benefit of the doubt, trying different approaches to loading, sorting, filling, second rinse, adding water. Always used Tide HE liquid detergent. The machine leaves dirty linty streaks on the clothes,especially dark ones. Polar fleece is the worst. Bottom line, if you don't put the wet clothes in the dryer, and line dry them instead, you look like something the cat threw up on. NOT TO MENTION it cleans poorly. The dealer has already sent out a technician once. He says the machine is set properly, I'm doing everything right and he can't see how the thing cleans. He says it doesn't appear to have any way to remove lint either. No kidding. I told the dealer I wanted a different machine and they responded by scheduling the technician again next week. In the end I'm afraid they'll put me on to the manufacturer and we can see from previous posts GE isn't very receptive. I'm totally frustrated. Thank heavens for sites like this one because the usual "We haven't had any other complaints about this machine" can't be peddled. Any suggestions? I have have several comments on this site regarding this lousy washer and I just wanted to update everyone. Besides complaining to every website that I am able to and trying to contact Associated Appliance, Sun City, AZ for months where I bought the machine, which only gets me the response of "I have a customer I will call you back". He has never returned my call. I finally contacted channel 12 news. They in turn contacted GE. GE sent out a repairman and they replaced the agitator. The repairman said he did not see how this was going to help with the problems of this washer. I have babysat the washer this past weekend and I want to say....I see no difference in the problems that we are all complaining about. I am still working with Channel 12 and I hope that somehow I can get some resolution. This machine is a "lemon" and that is putting it mildly! I am asking everyone that is unhappy with this washer to contact their local TV stations for help. We purchased this washer and the corresponding dryer in June. Once this fall I had a load that would not drain/spin. I occasionally noticed clothes being too wet, although always cleaned. However, a couple of weeks ago we ended up with soaking wet clothes again. I thought my son had just used the wrong load size, so i did a couple of other loads to test. Each load needed to be wrung out individually before going into the dryer. No drain and spin. Tech came out, and said the motor is not getting electricity. He didnt' have a motor with him, and now I have to wait for the motor to come in (he is ordering it today and it should be here in one to three days). More backed up on laundry, with a very active family of boys. Great. Thank God it was during the warranty period, at least, but it is ridiculous for a motor to go bad this soon! Worst washing machine I have ever owned. Not sure why they give you a capacity size option because the water fills to the same level everytime and does not cover all of the clothes. Does not spin the clothes out unless I keep it on extra spin. Suppose to be able to load to capacity but clothes do not get clean and it does not spin out. I used to live in a house with powerful water pressure, so at least the clothes got sprayed. At my current house the water pressure isn't as good, and the clothes on top don't get wet. I have to manually move a load of 2 bedsheets around so everything gets its turn in the soap. I am going to replace this less than two years old machine, and my conscience won't allow me to resell it at a garage sale. I have been fighting with this machine for 9 months now. I had today off and thought I would check on opinions after taking my darks out of the washer and getting mad about all the lint on them. I was glad to find it was not just me having trouble with the machine. I WOULD NOT RECOMMEND ANYONE BUY THIS MACHINE!!!! If anyone figures out how to get rid of these machines without losing their money please post it. I purchased this machine in August. I wish I read these comments prior to purchasing it. I bought it from Home Depot and I wish I could return it. It is junk. Some of my clothes never get fully wet. They come out of the wash with what I thought were spots only to realize that it was the contrast of the parts of the item that got wet and the part that never got wet. I got a large magnet and watched the whole process of washing. This proved to me that some of my items never got wet. Not wet, how could they be considered washed! I purchased GE because my old machine (15+years) was great. I wish I had it back. Now I feel like I'm down at the creek washing clothes against a rock. I put the HE soap in the machine, add fabric softener and clothes around the infuser. I close the lid and wait till it stops filling. Next, I open the lid and move the clothes around to be sure they are wet. Then close the lid and hope they are being washed. All this takes time, time which I don't have. Don't waste your money, it is a rip off!! Worst washer I've ever owned! This washer is a piece of crap! It does not wash well and leaves clothes with residue and lint. I have had it for one year and it has been the worst purchase I have ever made. I will never buy another GE product because of the bad experience I've had with this washer. I have three active children and have to wash several times per week. Sometimes I have to wash the same load twice to get the dirt out. I have to invest a lot of time when doing laundry because the water level never goes up(not even in the large load cycle), so I have to stand by and wait for the water to stop filling, so I can use the reset button to put more water in the washer. I hope that whoever is considering buying this GE model washer, comes across some reviews like this one that will stop them from wasting their money. I don't like this washer, it doesn't clean the clothes it leaves residue all over them, when I complained to the company they sent a repair man out, a repairman was out three times and all tell me they found nothing wrong. One repairman had the nerve to tell me to wash small loads and put on large cycle, why would I buy a large size washer and can only wash small loads on large cycle. I feel the washer needs to be recalled, whats the point of having it if you can't use it. I am always at the laundry mat, I feel I wasted my money and definely spending too much money going to the laundy mat. Someone needs to do something, this is an injustice. The company should never have put this washer on the market, I am sure they knew there was a problem with it. The spin cycle will hit the brake if you lift the lid! And yes, mine bangs like it wants to jump through the ceiling and its on a concrete and tile floor (wife is afraid to go into the room when its banging)! I have never seen a worse design in my life. Tore it apart to find sludge in the sump which was designed inside the tub, not outside. Cleaned the film off the outside and inside of inner tub and inner side of outer tub and bottom of outer where sludge was. Wife says better, but for how long? And I am looking for a better washer, so I called a buddy of mine who works for an appliance parts store, he said Speed Queen makes a washer for domestic use that is the same exact design as their commercially used model. My experience has been that Speed Queen is noisier than usual, but is a superb performer compared to newer HE models. Wish I had my old GE back. Good luck. We just purchased this washer and what a joke. It is going back tomorrow and I suspect we may never buy another GE product. We are a family of six with four active kids and have had two previous washing machines over a 20 year period. We loaded the new GE five seperate times this morning after repalcing the old washer. We used the proper detergent on the extra heavy setting and super load size on the last three loads. Everything appears to be operating properly per the manual and the clothes do not get clean......not even close. We are now re-enstalling the old washer and plan to buy something other in the near future. I now wish we had done our research in advance, but did not think a recognized business would sell a product that performed so poorly. This is the first time I have posted comments on a products poor performance. Two main problems with this washer. There is a musty smell we can't get rid of and our white clothes are not white anymore. My wife has tried everything. We will not buy a GE washer again. I wish I had found this site before buying this piece of garbage but I'm glad I found you tonight. I was thinking I was missing something, I even went to the GE site and watched the video. Now I know it's the machine and not me! This washer is JUNK..
How do you wash clothes with no water??? my sheets come out in knots,the lint is everywhere.I have called both GE and HOME DEPOT and they play the "not my problem game", I wish there was someone who could once and for all stop these big CO. from their games and take care of the little people who are now stuck with this piece of junk...I don't know about the rest of you but i spent over $450.00 dollars for this piece of junk.I think i might do better with a wash board. DISGUSTED!! I don't have a problem with the way that it cleans. Yes sometimes clothes do come out very tangled. Anyone know how to stop this permanently? I'm not as dissatisfied as many are below, but this is not right. Is machine is junk. I have only had it over a year and I don't know what to do. The noise it makes is so loud and I keep being told to level it. I have, it doesn't matter. And everyone is right it doesn't clean the clothes but it does leave soap and lint all over them. Didnt have 15 loads in and at the start of the wash I thought I heard a small clicking, a few minutes later, there was a loud thump as the front of it almost came off the ground. Of course I stopped it. Service man said parts will be about 2 weeks. Only a month old washer. Never GE anything again. Second time in 5 years I had a serious problem with a new item from GE. I have always liked GE products, until this piece if CRAP. This is a joke really would love to cuss and tell the world what a crappy washer it has made. If you find it on a give away, do not take it. in the first year i had three service calls because the machine would fill and drain but not wash-the magnet sensor was not working-and was replaced-now my floor is wet...thought it would be a seal-wow would never have thought that the thing is broken...literally-the clothes basin-it sits inside another PLASTIC basin-and that plastic basin is broken-cut-shot. has anyone else had this problem? cannot figure out what could of caused this-as much as i hate this washer-accepting that 400.00 only lasted 15 months is ridiculous. Home Depot rejected my review below and not posted. We bought this washer in Jan. 2010 and are very unhappy with it. We use HE soap and load the dirty clothes as instructed but the dark clothes come out with lots lint especially the fleece jackets and swimming suits. We called Home Depot but they told us to call GE. We called GE and they sent a repairman to fix it. The repairman said that it works as designed even though he ran a test and saw the excessive lint on the clothes. He then told us to call GE CR (Customer Relations). When we called GE CR, first they told us to call Home Depot and then said there is nothing they could do. After lengthy conversations with GE CR, they said that we could find another GE washer and swap with our machine (of course we are willing to pay the difference). After further research, we found all GE washers have bad reviews. We called GE CR several times and posted online to request to remove our washer and refund money. GE is just ignoring us. this is an awful machine. dark clothes come out with white spots on them - i'm using hardly any detergent and it still does the same thing - even with a second rinse. wish i could take this back to Home Depot for a refund. DO NOT BUY THIS WASHING MACHINE. My 15 year old machine washed better than this one. I just purchased this washer and matching drying tonight. It is scheduled to be delivered on Thursday, but I am on my way to the store first thing tomorrow to cancel this order. Thanks to all the honest people who expressed an opinon and warned me about this machine. I've had my washer for over a year now. I was pleased for the first few months - clothes were clean, didn't have the problems that many others are having. Then it would intermittently stop at some point during the wash cycle. Sometimes I could do the "drain and spin", and sometimes not. The technician came out three times and replaced the motherboard and another part each time, and it finally started working. Now I'm finding the very same problem - I'm pretty sure it's just a sensor problem (it can't figure out what the water level is), but I can't find a schematic so I can see where it is. Of course, it's out of warranty now, and they'll say they have to send out a technician to diagnose it and then he'll have to come back if there are parts to be ordered. I do regret buying this - at the time, the reviews I saw were good but I guess not too many had been sold then. My bottom line on this piece of junk is that GE just does not care that their product has all these complaints. I am wondering if one of the TV stations would be willing to listen? Forgot t change the stars! Doesn't even deserve 1 star. I absolutely hate this washer!I keep finding clothes with soap residue on them. So added to the babysitting duties I have to swish the soap around before adding clothes so that it doesn't end up a big blob on my clothing! I purchased this model. After 1 day of clothes not getting clean. I exchanged it for another of the same model. The multiple speeds do not exist. There is no "pulse" or "fast" cycle. It is all a very slow agitation, slower than my delicates cycle on my old washer, no matter how I set it. Supposedly there are several combinations of cycles, I got only one ON BOTH MACHINES. The other reason I exchanged it was because I bought a large capacity washer so I could do a large load. I washed one king size blanket, which I loaded according to the manual, and I had room to spare. However, prior to the rinse cycle part of it never got wet. How could clothes get clean this way? Hopefully I can return both the washer and dryer and go with another brand. I have owned this washing machine about one month. The clothes come out full of lint and I have to use a lint brush and my fingernails to remove heavy wads of lint. The manual suggested washing items with the same nap together. I tried a red blanket and a blue blanket which were exactly the same type and age. The red lint ended up all over the blue blanket and the blue lint ended up all over the red blanket. None of my experiments have worked so far. In addition, the clothes are extremely wrinkled, more so than normal after the spin cycle. I am very displeased with this machine, but it looks like I am stuck with it. It is quite obvious that GE is not interested in all of the complaints. I have sent emails to them several times and the only response that I have received is to watch the video regarding the awful noises and it is still under warranty, so we will send out a repair person! I replied to last email that you are not listening! There is absolutely nothing a repair person can do to modify this piece of junk unless he is going to bring a new machine that is an upgrade to this lemon that actually does the job as advertised! (Like that is going to happen!) I will never buy another GE product! I'm so disgusted with this washer. It's supposed to be a colossal and I can't put more than 3 towels in with a normal load or they don't spin dry. ugh. I put a standard sized pillow in sideways and when the load was done, only the bottom half of the pillow was wet!!!! It didn't come close to the middle of the machine's tub. What a piece of junk. I called GE and they were very rude. Said they wouldn't replace the machine with a better one even if I paid the difference. Nice to know their warantee isn't worth the paper it's written on. After 7 months of perfumed, unrinsed, unclean, linted, spotted clothes, we finally got rid of GE's washer, which we call an expensive 'boat anchor'. Bought a new Maytag (Whirlpool) and voila! Clean, lightly perfumed and rinsed clothes. The delivery folks (who originally delivered the GE, who got an earfull on just how bad BA was) took the GE brand spankin' new clothes trasher with them, good riddance. Hope GE redesigns, engineers their next experiment with a little more care for their loyal (now lost) clientele. I was curious to see how this contraption could work with the, never before seen agitator design. I see the clothes are coming out nice and clean, but still am not sure if it is working properly as in the largest selection, the water level remains about 1/4th the height of the tub. The clothes do get wet, if the door is shut as it rotates while filling. (use a magnet to override switch and keep your hands out when engaged or it can break your arm). I just bought this machine tonight after my MAYTAG front loader door blew and flooded my laundry room this morning. I THOUGHT the super capacity with no agitator would be wonderful, we have 8 kids! I have washed 2 loads tonight, the small load was OK, but the load of towels? Some never got wet until the rinse cycle! I know, I kept checking! And the NOISE! I was so disappointed when I saw there wasn't supposed to be much water in the drum. You can't get clothes clean without water! I really thought this was going to be a dream machine. What a joke this "washer" is. I'm not getting stuck with this worthless machine. Back to LOWES it goes in the AM and I guess it's back to a front loader. Oh, the first one we brought home (brought home 2 tonight) had been returned, we found the return paperwork inside the drum when we went to set it up. Now I know why! I received my new GE washer yesterday morning. After my first load, I was very happy, clothes were extrememly dry (must have a good spin cycle I thought) When I went to put my second load in the dryer - they were hardly spun out!!! There was this clicking noise that didn't stop - so I tried to do an extra spin - I don't even think the machine moved - OH well - mine is going back today! I am not taking any chances after reading these reviews Guess I should have read them first! We have had this machine for two months. Thank God we bought it at Sam's Club. We have 90 days to return it. We are looking for a replacement. This is a soaking machine. Doesn't matter how much high effeciency soap or bleach you add the clothes come out stained under the arms and around the neck. I have given up. We are returning the machine. You need to hand wash the clothes before putting them in the machine. Please save yourself time and money, buy a different machine. Our clothes come out looking more soiled than when I put them in the machine. It seems counter intuitive that Jean's "experience" could be so contrary to reports of the majority here. Giving GE every benefit of the doubt, I used Tide HE appropriately, read the manual several times, and experimented with trying to make it work adequately for 6 months. Then the washing machine technician said HE couldn't see how the machine cleaned and there was NO way to remove the lint from the wash. There are fundamental design flaws here. When a washer can't even get underwear cleaned, what good is it? Who am I going to believe, Jean or my lying eyes? I ended up replacing it with a similarly priced new Whirlpool which uses 25 gallons a load and does a good job. The appliance company in Concord switched it for free. I am so disgusted with this machine. I've had service techs come out three times. GE refuses to exchange for a better model. I get black greasy looking streaks on the clothes. Even though I use HE detergent, and very little of it, there is a build-up underneath from using that and fabric softner. If I'm using the right detergent why is it building up? The tech told me to buy a $15 bottle of cleaner to keep using in the machine so the gunk doesn't build up. Clothes is very stiff when I take it out so I have to use fabric softner. If I use any less detergent the clothes don't even smell clean. It takes over an hour to wash a load. How is that energy efficient? I'm bringing this one to the dump. Buyer Beware. The GE customer service department was very rude. This is the worst washer I have ever owned! I am so sorry that I purchased it! I had a 15 year old Maytag that was quieter than this thing. I absolutely hate this machine! I wish they would take it back or allow me to trade it in! I have never read so many comments from unhappy consumers. GE sent me an email and told me to watch the videos so I knew what noises to expect. You have got to be kidding me. I recently posted my unhappiness on here but used anonymous accidentally. I have had this washer for a month. I have washed delicates, regular clothes, king sized quilt, throw rugs, and dog beds! Everything has come out clean, no lint and no residue. Maybe everyone is using either too much or too little detergent. Use HE detergent and read the manual, I have had no problems. This is actually the best machine I have ever used. I am very happy with it. Most awful machine I ever owned. God forbid if you try to wash alot clothes. They never get clean. I would never buy a GE machine again. Can't believe they are not making it right. If you want clean clothes DO NOT BUY this machine. Did anyone respond to the GE comments? I responded with all my information and what I received was an email with a video telling me why the machine makes noises. I can understand the mechanics of the machine, I don't accept why I have to hear every change the washer makes during and between cycles. I wrote back and told them I did not find the video helpful for how loud the washer is. I am really sorry I purchased this washer. why did i buy this ? What a disappointment. I am so sorry that I bought this washer and GE Dryer. The small amount of water that goes into the large tub, just doesn't do the job. Unfortunately, it does not rinse the fabrics enough and I have to double rinse every load. Therefore, I am using MORE water, not conserving it. The instruction manual is not sufficient. I had to stay in the laundry room and check to see what it was doing. I realized there is only 3 showers as a rinse so you have to use "second rinse" to get it to fill and agitate a rinse. This washer is so noisy! It is suppose to have a quiet package, but I hear every cycle change including the water being pumped out! I had a Maytag for 15 years and never even heard it running, let alone the water being pumped out! It twists my clothes and sheets all up. I wish I would never have purchased this machine. I just did a small load and had to rinse some of the clothes by hand because there was soap on them, the water was set to large! About the only thing I like about it is the fact that it spins so fast that the clothes have very little water left in them. Except the load I just did, one of the tops was still soaking wet! I am sorry to hear of the difficulty you have experienced with your GE washer. We value you as our customer and want you to be happy with your GE appliances. Please email us at eresponse@ge.com including your model and serial numbers along with your name, address, and telephone number. Also, provide a brief description of the issue you're having. We'll be happy to look into your situation. Using this maching makes me frustrated. Clothes never get cleaned, and I have to wash the same load of cloths using : pre-wash + heavy load cycle + 2nd rinse + HAND RUB the dirty area of the clothes. Clothes also become very wrinkle after washed. GE should recall this machine, or they will continue to loose the customers. DO NOT BUY THIS PRODUCT!!! I bought this machine to replace a more-expensive Whirlpool Cabrio which self-destructed in less than three years. This basic GE model was so reasonably priced, that I was skeptical, but after a dozen loads of laundry, I'm pleased with it. I use the recommended HE detergent (All), don't overload the basket, and keep the water level set on "super" (maximum). The machine is quiet, and cleans my clothes very well. In fact, it removed some set-in stains on a favorite cotton sweatshirt that had been stuck there for at least a half-dozen previous washes and machine-dries with my old equipment. I read so many negative reviews of this washer that I decided to to purchase a 5-year warranty from the retailer, but so far so good. I hate this machine! It does not get clothes clean, no matter how you use the settings. I wish I had read reviews on this product before we bought it. So far GE has refused to replace it with something else and after reading these reviews,it sounds like they never will! I will keep my eyes open for a class action lawsuit and gladly join it. In the meantime I will buy something else and never ever buy anything from GE again! One other problem that I have had with this machine that I haven't seen from anyone else is that the load easily gets off balance and then the washing machine slams itself around banging into the dryer on one side and the sink on the other. You have to shut it off manually; it won't stop itself. The GE WHRE5550KWW washer is awful! The reason the clothes don't get clean is because for the first one-third of the wash cycle half the clothes don't even get wet. The YouTube videos that GE put out are a sham! They show about one-third as many clothes in the washer as GE recommends. I've had my GE WHRE5550KWW washer less than a week. I called GE to complain. They said they will NOT replace it with another model, nor will they take it back. The only thing they offered was to have a service technician come out and make sure it's working as designed. But it's the flawed design that's the problem! They claim the GE WHRE5550KWW washer is "4.1 cu. ft. colossal capacity", but that's only if you fill it according to the GE's directions. Then it doesn't clean the clothes! The only thing that works is to use the super capacity setting and then put in a very, very small wash load, and that doesn't do a very good job cleaning the clothes either. The rinse cycle doesn't get the soap out, so they put an option for a 2nd rinse cycle. Then they tell you (in the owners manual after you buy it) that, if you use the double rinse setting, it's not energy efficient. Well it's certainly NOT energy efficient to only be able to put 1/3rd as many clothes in it and run it 3 times as often, because you'll use 3 times as much water and 3 times as much electricity when you do. This may be the worst product GE has made since the refrigerator that GE had to replace in a class action law suit a couple of years ago. No wait! - This one is worse, because at least the refrigerator actually worked. It kept food cold. This washer is just DOES NOT clean clothes. We can only hope that some bright attorney starts a class action law suit against GE to replace these WHRE5550KWW washers with another model that actually works. Legal action seems to be the only thing that motivates GE. I'm surprised that there aren't a lot more bad reviews on this product. And I'm pretty sure that the good reviews are put there by GE. I see that some of the comments on this page have neglected to change the default 5-star rating to one-star. It actually says "rate this page". It probably should say "rate this product". Someone please get a class action suit going against GE for this! If you do I'm in. Short of that let's boycott all GE appliances, and try to avoid other GE products and services until they begin to take responsibility for their actions. Anyone who has bought one of these should post their negative comments on as many appliance and washer review sites as they can. This may prevent many others from making the same mistake. GE really screwed up on the WHRE5550KWW washer and they should either voluntarily make it right, or be forced to by the court. Top load GE washer model whre5550k. Used this product for 4 months now. Lint and detergent marks (residue) on sweatshirts (and similar clothing textures) consistent throughout the 4 months. Had to use toothbrush to remove lint from article. I was appliance tech for 15 years working on all appliances all brands. If I had a customer who experienced such design problems, I would have to give their money back and encourage them to go to another brand. However, I have learned that many brands now use HE or IEC technology. GE was one I recommended--until now. In the 40 years I have used GE washers and dryers, and in the 15 years that I worked on them, I had seen their best years in production. This is the worst engineered washer I have ever seen. All electronic, bound to short under high heat humidity, leaving spots over all clothes, just terrible performance and functionality. Contacted GE for an exchange, I was willing to pay the difference for a better performing machine. Was denied exchange meaning that they have nothing better. DO NOT BUY!!! There's a pretty interesting special on that washer at the moment and was planning on buying it but after reading the reviews... NO WAY!! Thanks for all those precious comments people, I think I just saved myself from buying a real piece of junk! I have had this washer for only 2 1/2 months and am going to buy another one (not GE) even though this is money wasted. Clothes do not get wet and they are so tangled and twisted it is impossible to put delicates in this washer. I hate it and can hardly wait to get something else. On my comment about the GE washer, I'd like to add that the appliance company has offered to exchange this for another similarly priced washer of my choice,kudos to them. I'm considering a Fisher Paykel with center post agitator. I bought this washer because I wanted a large capacity machine that would wash comforters and blankets but I did not want a front load machine. This machine was a big disapointment. Even on the shortest cycle it takes a long time because it doesn't use any water. Setting the super water level only fills it about third of the way.I would much rather have a machine that uses water and washes quickly which saves electricity than this machine which saves water, which is cheap, and has to run along time useing electricity , which is expensive. It does get the clothes clean although dark clothes have lint on them. I have not tried to wash a comforter in it because I cannot believe it can do the job without water. The big tub is deceptive, only small loads get clean. If you want to get your laundry done fast, do not buy this machine, it takes forever to complete a cycle. Very unhappy with this washer. Maybe I'm one of the idiots who reads the product's owners manual because this washing machine works really well and my family is very pleased with it. Clothes are washed thoroughly, spun out perfectly, and the machine is so quiet that we hardly know it is running. Add fabic softener in slot, add detergent before clothes, and then stack clothes around the agitator...not over it. Make sure you select the correct water level, fabric softener option, and clothing option. We've had it for three weeks and are very pleased with its operation. I'll give you a six month review update. DANGER!!!! Main motor DIED in under 1 week after about 10 uses. GE Service came out next day, and the technician said he has to order a whole new motor assembly, however, the motor is back ordered (many others having same issues...????) and may be 2-3 weeks before the unit can be repaired!!! An appliance should have a 5-15 year life, and the manufacturing company should do a much better job of building robust units and extensive testing before releasing this corpse to the public. Poor quality control. Minor problems with dials or setting controls can be expected, but the main motor dead after 10 uses...? Unbelievable... Especially from an establised company like GE. No wonder why we are loosing manufacturing to other countries like China, Indonesia, Japan. Mine works just fine. I tend not to overload my washer and use gain detergent. Maybe mine was a mistake but Im very happy. gets all my stuff clean! (even my friends) bring there clothes over cause the laundro-mat is getting too expensive, and they like mine better than the commercial ones. hmmm.. Maybe cause I wont let them OVERLOAD and yes I have a super loader! I have the same exact problem as the previous poster. I am returning it tomorrow. The things on the top never even get wet.